The activity is part of an ongoing effort at the Texas A&M AgriLife Research and Extension Center in Dallas to address declining freshwater mussel populations across the state – a trend that could signal declining health in Texas' river systems, Morton said. 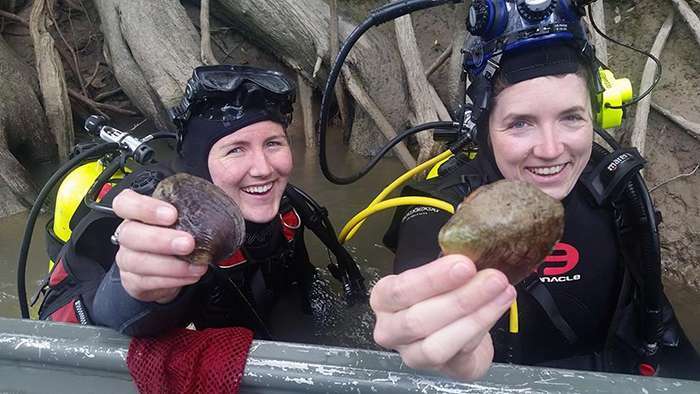 "Freshwater mussels provide a service to the ecosystem as filter feeders," she said. "They help to clean the water, filter sediment, and contribute to nutrient cycling. They draw nutrients from the water and make them available to other organisms." Of the 52 freshwater mussel species in Texas,15 are listed as threatened by extinction at the state level, according to the Texas Parks and Wildlife Department. Of those 15, 11 are candidates for "endangered" status under the U.S. Endangered Species Act. "Mussels are indicators of healthy rivers," Morton said. "They are resilient animals, so the disappearance of mussels from a river can be a sign of long term water pollution problems. By improving water quality for mussels, we would also improve quality for people who rely on these rivers for drinking water and recreation." Morton's work studying trends that lead to widespread mussel decline is housed at AgriLife's Dallas Center but implemented by her employer, the Texas A&M Natural Resources Institute, which falls under Texas A&M AgriLife Research. The institute aims to improve conservation and management of natural resources through interdisciplinary and applied research. But in May, Morton entered the U.S. Fish and Wildlife Service's 12-week Directorate Resource Fellowship Program at the organization's San Marcos Aquatic Resources Center. There she will begin new research into declines of the Texas hornshell mussel, which in late 2016 became the first state species proposed for listing as nationally endangered. The official listing process, which includes a period for public comments, is ongoing. Morton's research with the fellowship program involves observing physiological tolerances and reactions of mussels to "dewatering" – an increasingly critical area in the face of climate change, drought and rising water demands, she said. "How long will they survive out of water and what is their behavior when stranded?" she said. "Do they continue to track the receding water or will they burrow down, and will they continue to survive? "Especially in the Rio Grande where (the Texas hornshell) is located, there are low-water events or heavy water withdrawal. This work would help U.S. Fish and Wildlife determine mussel vulnerability in those scenarios." She said Texas hornshell populations are especially important to ecosystems along the Rio Grande, where "there is a pretty low diversity of mussels to begin with." That urgency increases where the river runs through arid regions of the state. "What we learn about Texas hornshell will be useful for other species across Texas," she said. "These are risks that apply to really any species across the state, and this work will paint a clearer picture of what's happening with mussels in Texas. Water demands are going up in the state, so water availability is a big issue for mussels."